special-use, and miscellaneous other land. 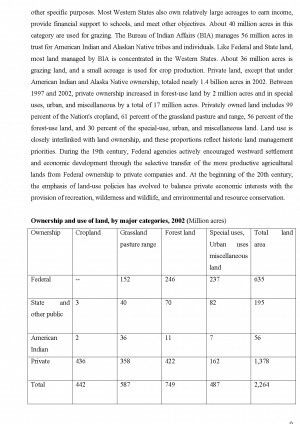 Land-use changes have important economic and environmental implications for commodity production and trade, open space, soil and water conservation, and other policy issues. 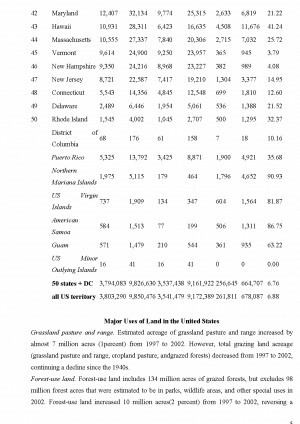 A first step in the study of land-use change is developing statistics on land use over time. 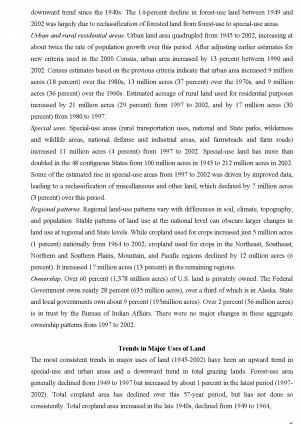 This publication presents the results of the latest inventory (2002) of U.S. major land uses. period. 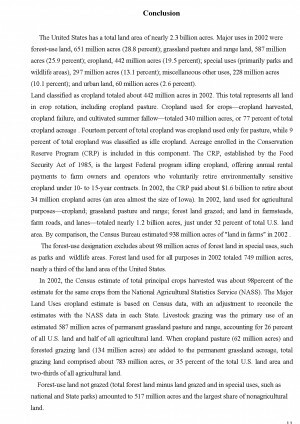 Between 1997 and 2002, total cropland area reached a new 57-year low, continuing a downward trend since 1978. 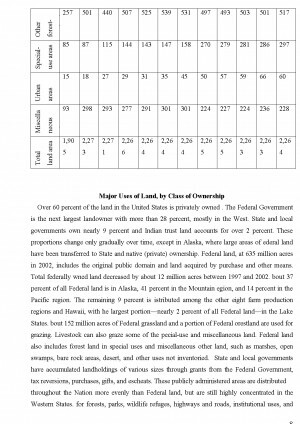 This report presents the results of the latest inventory of U.S. major land uses, drawing on data from the Census Bureau of USA, public land management and conservation agencies, and other sources. 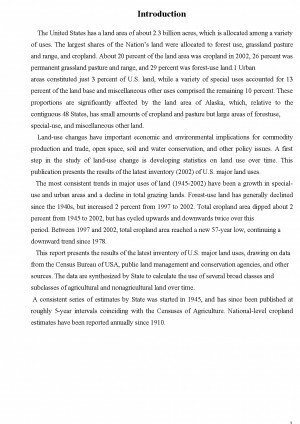 The data are synthesized by State to calculate the use of several broad classes and subclasses of agricultural and nonagricultural land over time. 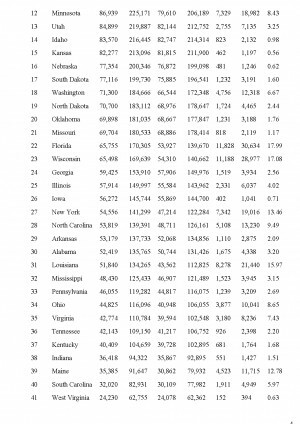 A consistent series of estimates by State was started in 1945, and has since been published at roughly 5-year intervals coinciding with the Censuses of Agriculture. 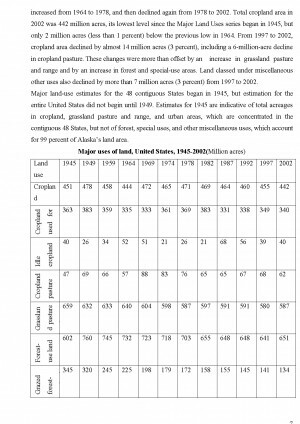 National-level cropland estimates have been reported annually since 1910. 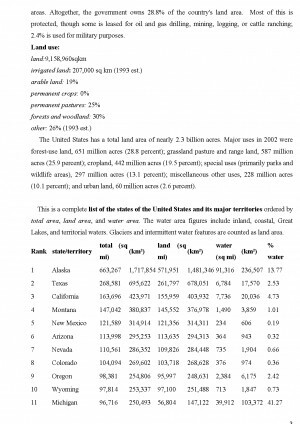 The land area of the contiguous United States is approximately 1.9 billion acres (770 million hectares). Alaska, separated from the contiguous United States by Canada, is the largest state, having 591,004 squre miles of landmass. Alaska is twice the size of Texas, and comprises 16% of the entire land area of the United States. Alaska is over 2200 miles long from East to West and 1421 miles North to South. Alaska has 33, 804 miles of costline, greater than any other state in the Union. Hawaii, occupying an archipelago in the central Pacific, southwest of North America, has just over 4 million acres (1.6 million hectares). After Russia and Canada, the United States is the world's third or fourth largest nation by total area, ranking just above or below China. The ranking varies depending on how two territories disputed by China and India are counted and how the total size of the United States is calculated: the CIA World Factbook gives 3,794,101 sq mi (9,826,676 km2), the United Nations Statistics Division gives 3,717,813 sq mi (9,629,091 km2), and the Encyclopedia Britannica gives 3,676,486 sq mi (9,522,055 km2). Including only land area, the United States is third in size behind Russia and China, just ahead of Canada. The coastal plain of the Atlantic seaboard gives way further inland to deciduous forests and the rolling hills of the Piedmont. The Appalachian Mountains divide the eastern seaboard from the Great Lakes and the grasslands of the Midwest. The Mississippi-Missouri River, the world's fourth longest river system, runs mainly north-south through the heart of the country. The flat, fertile prairie of the Great Plains stretches to the west, interrupted by a highland region in the southeast. The Rocky Mountains, at the western edge of the Great Plains, extend north to south across the country, reaching altitudes higher than 14,000 feet (4,300 m) in Colorado. Farther west are the rocky Great Basin and deserts such as the Mojave. The Sierra Nevada and Cascade mountain ranges run close to the Pacific coast. At 20,320 feet (6,194 m), Alaska's Mount McKinley is the tallest peak in the country and in North America. Active volcanoes are common throughout Alaska's Alexander and Aleutian Islands, and Hawaii consists of volcanic islands. The supervolcano underlying Yellowstone National Park in the Rockies is the continent's largest volcanic feature. 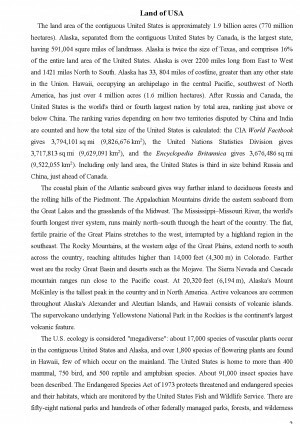 The U.S. ecology is considered "megadiverse": about 17,000 species of vascular plants occur in the contiguous United States and Alaska, and over 1,800 species of flowering plants are found in Hawaii, few of which occur on the mainland. The United States is home to more than 400 mammal, 750 bird, and 500 reptile and amphibian species. About 91,000 insect species have been described. 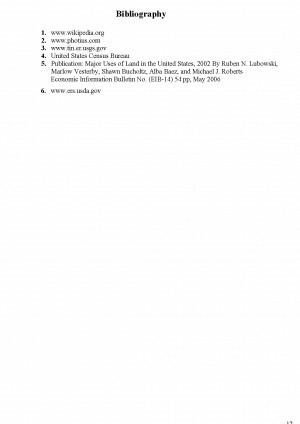 The Endangered Species Act of 1973 protects threatened and endangered species and their habitats, which are monitored by the United States Fish and Wildlife Service. There are fifty-eight national parks and hundreds of other federally managed parks, forests, and wilderness areas. 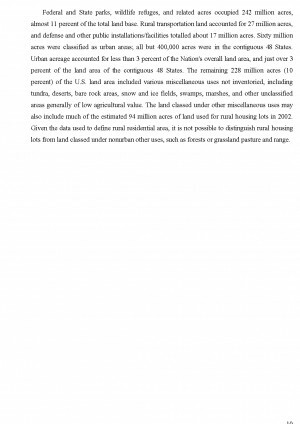 Altogether, the government owns 28.8% of the country's land area. Most of this is protected, though some is leased for oil and gas drilling, mining, logging, or cattle ranching; 2.4% is used for military purposes. Descarcă referatul cu titlul "Land of USA" cu plata prin SMS pentru 4 € + TVA. Plătești un referat și primești 2 (al doilea gratis).